"Mercy! Dreadful apparition, why do you trouble me? Why do spirits walk the earth, and why do they come to me?" -Ebenezer Scrooge from A Duckmas Carol. I'm inordinately proud of this picture. No photoshopping involved, other than reducing it to fit The Pond's formatting... this is how it looked out of the camera. But how? Read on to see the behind-the-scene story of A Duckmas Carol: The Picture. Generally, I don't put a whole lot of effort into the preparations for a picture. Oh sure, a couple of minutes will be spent positioning the duckies, and a few more in actually taking the pictures, but all in all even the most complex only take ten minutes or so. This one took three hours... three hours and $30. After all, I had to create a theater stage for it. Take a cardboard box, line it with black posterboard. 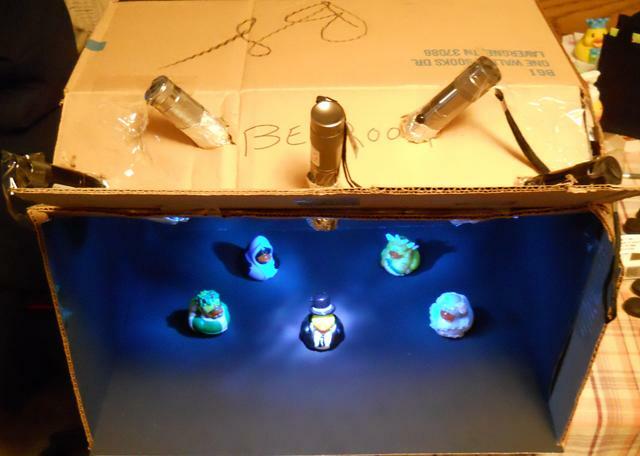 Cut holes in the top of the box and stick flashlights into them, one per duckie. Take a blue plastic expanding file folder and cut pieces out of it. Use the pieces to cover the lenses of four of the flashlights. 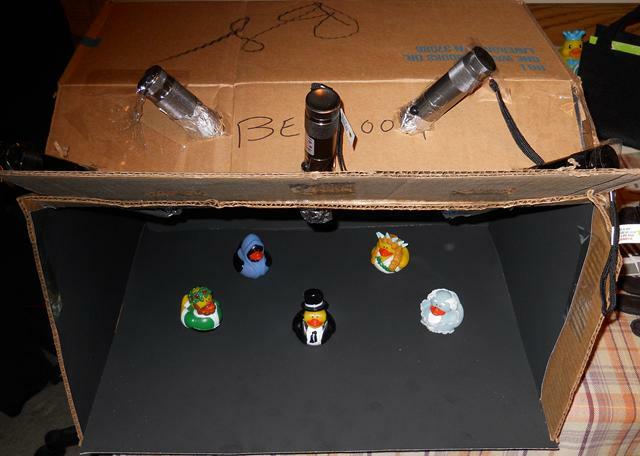 Then form snoots out of aluminum foil and focus the lights down onto the duckies. Gently manipulate the snoot aimed at Scrooge so you get a gobo-like pattern on the floor. Realize that this is all stuff that you learned while earning your theatre degree, four and a half years of college and two years in grad school. Finally, turn on the flashlights and realize that it was time well-spent. Then carry the whole thing (gently!) into a dark room and take a couple dozen pictures at a shutter speed of 1/4th of a second, praying that you managed to keep your hands steady. That's what it took to make this picture. I don't think I've felt more chuffed than when that one up-top appeared on my screen... I wasn't just taking pictures of rubber duckies, I was actually making art. Yeah, that worked out pretty okay. Post contains 345 words, total size 3 kb. Clearly, I need to step up my game. 2 Impressive. But where's the stagehand in black, trying to be unobtrusive upstage? 3 Upstage of the Ghost of Duckmas Past, Vauc. You have achieved great win with this. 5 Oh, yes, of course. 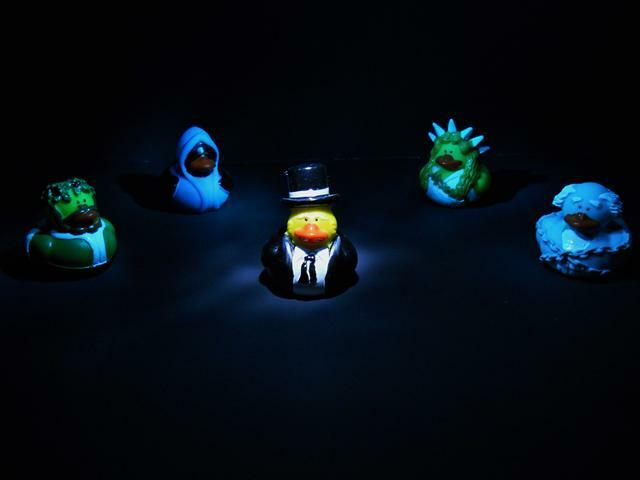 6 I read friend GreyDuck's Quacked Panes religiously; I am exposed to his duck collection several times a week. And yet this is the first time I've ever looked at a set of ducks and thought, "WANT!" 7 Well, they'd go with your storytelling of A Duckmas Carol, wouldn't they? There's a Tiny Tim duckie that's part of the set as well, but obviously it wouldn't fit in with the picture. 8 Brilliant. I love it! 24kb generated in CPU 0.08, elapsed 0.1818 seconds. 47 queries taking 0.1581 seconds, 252 records returned.